I have been a iPhone user for 5 years now. From the 3G to the 5S. And I have loved playing games on the iOS platform. I think the main reason is because the platform just works. The OS is stable, the hardware can be repaired anytime in the store and even though the app approval policy may be strict, it makes for a seamless gaming experience. I would like to note that I am not flaming other platforms at all. They have some great features that I wish Apple would integrate, using an iPhone is just personal preference. I assume some of these games will be available on other platforms as well, but obviously I can’t predict the same since I stick to iOS. All the games I review have been played by me for at least 5 hours, hence proving to me that there is something in each game which I like and which convinces me to keep coming back to play. Before we get into the meat and potatoes, I would like to mention that there are 2 games which I played on previous mobile platforms which I wish would be ported over to iOS and at the end I have a bonus list of games! If there are any great must play games you think I should do an indepth review for, leave me a note in the comments! I have seen & played this game only on the Nokia N70. This app is a chess endgame which requires you to get to checkmate in a few moves. It is very interesting as the board seems to be randomly laid out even though it has static solutions. I love puzzlers and chess being the iconic “perfect” logic game, it is super interesting, has thousands of possible games and it kept me hooked for about a year until I changed my phone. The following link is ad heavy, however it plays on the computer (It’s a flash game) and is a fun try for those who want to check out the game. This game originated on the iconic Nokia Communicator. It is a Side Scroller and you have to take the ball through obstacles to reach the end of the level. The fun part is that you sometimes perfectly have to go through the rings, which is doable because of the D-pad on the phone. Also, the inherent mechanics of a ball let it float and also burst, which give way to interesting game elements. Also, you can inflate the ball (very Mario mushroom style) which adds further elements and challenges into the game. There is an iPhone version of the game but since it has been converted to 3D, its not very well done. The Android version is the original but for some reason its not available on the iPhone :(. This is the iPhone version of The Incredible Machine game and requires you to to use gears, pulleys, rubber bands, belts and other innovative items to create simple machines. Its not as complex as it sounds, but is awesome fun to create new things out of parts and get the final machine working! This is a very simple guessing game, but keeps you engrossed for hours. Its about how many Logos you know. I found the concept really interesting as it shows how much consumerism and marketing helps. I was shocked that at the get go, I knew over 200 Logos! It also has a great social component as I kept pulling out the game when I was with friends asking them if they knew of Logos that I couldn’t identify (I don’t like using up my stars and hints :P). Game Type: Freemium, Pay for coins to unlock hints. I saw this game at the New York Games Meetup and its a reinvented version of Solitaire. The premise is that you get 4 cards at a time and need to replace them with higher cards, with A replacing anything, Q replacing only Hearts and Diamonds, King replacing Spades and Jack replacing anything below it. What makes it even more interesting is the Endless mode and the Kings mode where you get extra points the longer you keep a King locked in one slot. And you have some feeling of progression as the themes get unlocked, the most beautiful being the Black theme. The Developer Kurt Beig is working on getting a verified solvable list of levels so that we have a chance to play a guaranteed solvable progression of cards. No games list would be complete without a Poker game. This Glu Mobile game is the best Poker game I’ve played. I like it because it has a long progression of levels to complete and the interface is slick and fast. The AI is good enough that you don’t feel they are cheating and make reasonable progression. It has 3 modes, a Normal game, Winner takes all and a Tournament which requires 2 levels on play. A big negative is that in the tournaments, the money doesn’t carry over from one table to the next, so if you dominate table one, you restart with a new stack at the final table. Unfortunately, this game is not available on the App Store anymore (no clue why), but I had to review it because I spent many an hour on it and no other Poker game I play, stacks up (Pun intended) even close to this one. The legendary Bejeweled game which has taken the world by storm. What makes it popular? Its well done, with the Candy Bonuses, simple interface, creative level design and innovative tiles (Chocolate, Licorice, Jelly, Cages). You have 6 lives which you exhaust every time you lose a level and you get a new one every half hour. It makes for an extremely viral game as you can post on Facebook and ask your friends for more lives. A tip for this game is that you can connect it to Facebook to save progress and then disconnect – This lets you go through every set of levels without having to share on Facebook. Also, I have heard that you can set forward the iPhone clock to regain a full set of lives or to avoid waiting a day if playing the final level in the set. This is a very interesting game where you need to break the blue glass without breaking or toppling the red glass. It is made more interesting with the bonuses you get, the best being the freeze which freezes the level and hence the glass doesn’t drop when you destroy the ones below it. There’s an art to this game because of the physics of the dropping glass. Drop too many at once and it will topple. If you see the picture below, the 3 blue need to be hit quickly so that all the glass at the top drops together. Another fantastic part to this game is the digital voice which exclaims New High Score and Perfect. It is an extremely well done voice over evoking Tron and Portal like feelings. Levels: ~30. Other packs need to be bought. Playtime: 10 hours per pack. Game Type: Paid, $0.99. $0.99 per pack. This is an absolutely awesome Physics game. I got this game for free during the App Store anniversary. It was great fun trying to solve all the various physics of redirecting the water. The level design is excellent and makes this a must play game. The game has many Easter egg bonus levels which are fun to find. One of my biggest gripes is that they don’t have a all in one level pack I can buy for their other characters, Allie, Swampy and Mystery Duck. And the individual packs only have 60-90 levels, not making a worth a buy. Hence, I bought the Wheres my Perry app for 0.99c which gave me about 120 levels, which I finished in 3 days. Disney recently released Where’s my Water 2, which is based completely on a Candy Crush types Freemium model, which has charges which exhaust if you lose too many levels. However, the level design is even better as you play the same level in 3-4 different ways. However, after 25 levels or so, it is required that you share on Facebook. According to me that is really bad design as it needs to have a way that someone can play if you don’t like to share at all. Also, the upside down mode, while fun, can be a bit nauseating. Levels: ~200. Other packs need to be bought. Game Type: Paid, $0.99. Other packs between $2.99- $4.99. This is the very first game I bought on an iPhone. This game is a physics based Labyrinth wherein you tilt phone to maneuver the ball. The accelerometer is really sensitive and that makes for a lot of fun and frustrating play. The free version lets you play through a few levels. Where this game really shines is the ability to download (for free) user created level packs which gives you an unlimited amount of levels to play. Sequels are available for this game, with a lot more complex and innovative design. However, for me the challenge in Labyrinth lies in its simplicity and I prefer the original version. I would say that this is one of the original ragdoll physics games available for the iPhone. You have to shoot ragdolls to trigger game mechanics and get the red Bullseye to finish the level. In the picture below, you need to push all 4 levers and then hit the Bullseye quickly before it drops out of sight. Sequels are available for this game and they are pretty good, especially since the graphics are better and level design is crazier! This game that has kept me engaged for the last few weeks. 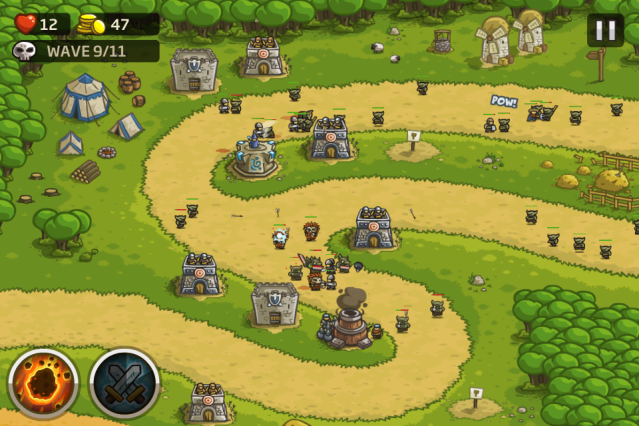 It is a tower defense kind of game but what makes it innovative is the different game modes and the fact that you can play one level in many different ways. The aim of the game is to create 4 different towers (Archers, Mages, Artillery, Barracks) and try to kill the incoming horde without losing all your lives. Each level also has a Pro and Iron mode wherein you get more money upfront but have to defeat smaller stronger waves and an unlimited wave respectively. Also, you win stars for each level which help spec out bonuses for each tower type. A gripe that I have with the game is that you stop using stars at about 65 when you can win 95 total. I wish I could do something with the last few stars that I win or I should win only 65 stars. A suggestion that I have would be to allow a sandbox for user created levels, which according to me, will make this game explode with even more users and give us endless gameplay. The game has a sequel called Frontiers which has the same concept, just newer monsters, levels and better bonuses. Both are definitely worth getting. This game needs no introduction, its the most popular mobile game ever. Launch birds at structures and destroy all the pigs in the level. Its simple physics, but becomes extremely challenging. There are different birds available such as the Yellow Wood Destroyer, the 3 in 1 Glass destroyer, the Bomber, the Egg bomb dropper etc. One of the best parts to this game is that they are still supporting the older versions and release new levels every few months. According to me, the Seasons sequel is great, but Rio, Space and Bad Piggies have been a big letdown. This is an awesome bricks game and there is a reason why I’m ranking it above games like Angry Birds and Candy crush. What I like about it is that is so very simple and the 3 in one ball bonus is insanely crazy fun. The aim is to destroy the bricks and get a bonus every few balls. The 3 dot in a row bonus launches 3 balls from the paddle, but the ∴ symbol gives 3 balls for every one. This quickly fills up the screen with tens if not hundreds of balls and its a pleasure to work through the pain of the first few balls to eventually fill the screen up! This is THE best physics racing game I have played. You get about Ten different levels and cars to unlock. The cars can be upgraded using 4 different statistics which could be : Acceleration, Tires, Suspension, Fuel, 4 Wheel Drive, Downward force etc. The fun part of this game is that the levels are seemingly endless (I haven’t been able to finish one yet) and each car is very unique. Hence, some cars suit some levels better. You earn coins for airtime & distance gained and it is these coins that unlock cars, upgrades and levels. This game is an absolute must try, especially since it doesn’t cost anything. One major gripe I have with this game is that after you unlock a lot of stuff, it becomes extremely hard to earn coins as you are playing the same levels over and over again, with the most efficient being the Dirt Bike on Moon and 4×4 on the Highway levels. They are still supporting the game so it is fun to get a couple of new levels and cars every few months! Levels: ~10. ~10 cars with ~ 60 upgrades for each car. Another bricks game, but what makes this game unique is the awesome level design which has unique “bricks” in each game. The bonuses are fun, the paddle and ball customization is great, but I have played this game 5 times over, just to go through the awesome level design. I really wish they would release more levels. I would definitely pay 0.99c for every 30 levels they release, this game is just THAT good. This is the second game I ever bought for the iOS platform and is a game like no other. What I love about it is the different concept and innovative yet challenging level design. The game is straightforward: Collect the keys, which in turn rotate the platforms and avoid the spikes, to get to the door. What makes it absolutely awesome is that you are required to “Shift” the level where you go from a Black character in white space to a White character in black space. If that sounds weird, it IS very hard to explain. I would look at the picture below for reference. If you see, the blockages on the left are Black with you in white space and when you shift (that is a different level) the blockages become White with you in black space. The best part is that the sequel is just as good. This is the game I show to everyone whenever they ask me for a great iPhone game. Hence, for me, this game is the epitome of creativity and level design and hence takes the #1 spot on my list! As a Bonus, these are some other games which are excellent to play on the iPhone, I just did not want to overwhelm anyone with a top 50 list 🙂 ! To reiterate, if there is a game you think I should review in detail, leave your comments below!